Facial rejuvenation surgery or facelift is a procedure that rejuvenates and gives a more natural appearance to facial muscles and skin. It improves wrinkles’ depth and saggy face chin, and neck skin. Facial rejuvenation surgery or facelift, may be complemented with other surgical procedures such as Blepharoplasty, Brow lift, and a neck lift. Am I a good Facelift candidate? This surgery is recommended for healthy men and women who don’t feel comfortable with facial aging signs and want to improve their face and neck appearance. Although it may be performed on patients of any age, it is recommended for those 40 and older. Facial rejuvenation is known by many names such as rhytidectomy or face and neck lifting; the difference lies on the scar: Long or short scars. Dr. Lina Triana performs both kinds of surgery. Short scar: An incision on the anterior part of the ear. It is recommended for patients with light to moderate facial aging, who do not have a heavy or loose neck. Long scar: Incision on the anterior and posterior part of the ear and on the scalp. It is recommended when aging can’t be corrected with a short scar. 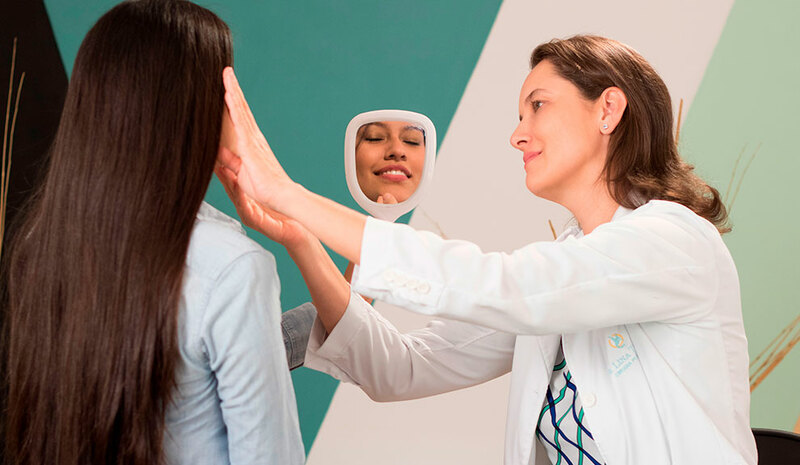 Dr. Triana assesses patient`s age, facial structure, and unique characteristics, in order to determine the best surgical approach, to achieve a fresh and harmonious appearance. Local anesthesia and sedation, or general anesthesia can be used with Facial rejuvenation surgery or rhytidectomy. The type of anesthesia is chosen by both anesthesiologist and patient. Short scar: A facial plication suture is done on facial muscles, achieving a natural vertical lift. Incision is made on the anterior part of the ear. Long scar: A facial plication suture is done deeper into facial muscles. Incisions are made on anterior and posterior parts of ear and scalp. How is post-op with a Facelift? To help muscle healing and repositioning, the daily use of a chin support during the first week is recommended, after that, chin support may be worn three more weeks and only at night.